There are millions of baby boomers approaching the age where developing dementia or Alzheimer's is a concern. Sparrman is convinced we can prevent the onset of those diseases or at least delay them for many years. She offers suggestions in four areas of life: physical activity, nutrition, intellectually stimulating activities, and social and spiritual connections. Sparrman shares the results of many studies, yet in a very readable way. Some of the information and suggestions were not new to me. Her section on nutrition included all of the sensible advice we've been reading about for years. She has included a few recipes. We also know we should be walking or doing some other form of activity as we age. I was surprised, however, at the benefits of hiking in nature as opposed to walking in an urban setting. I was also surprised to find out about the friendly microbe beneficial to gardeners. There were also some surprises for me in the social section of the book. There are measurable benefits for families who eat together around a table at least five times a week, for example. I am in a reading group and was pleased to find that such a group participation was one of Sparrman's suggestions, as was journaling. I was also reminded of the high cost of being mad or bitter and of the benefits of being optimistic. I highly recommend this book to readers who are baby boomers and are entering into that age where one is concerned about reduced brain function. This book is very readable, full of facts, and has great suggestions for keeping your brain functioning well. It is a great resource for being a good steward of the body God gave you as well as living a more enjoyable and fulfilling life in general. Bonnie Sparrman has worked as an OB nurse and Parent Educator in several different cities in the U.S. She is the author of several books. We certainly live in an era of self focus. Yet we know from Scripture that we should be connecting with others. How do we do that if we are an introvert? What if we're cautious because we've been hurt in the past? George has written this book to help us connect better. He is an introvert himself and tells lots of good stories. The style of the book is to identify a concern about connecting with others and then offer suggestions to overcome that and form positive relationships. I could really identify with his concerns. Who hasn't been hurt by one supposed to be a good friend? Who hasn't come to the conclusion that so many others are unthinking and uncaring, or as George puts it, idiots? George does a good job of answering all the objections. I was impressed with George using the example of Jesus. He had to deal with so many difficult people. I am to be Christlike and follow Jesus in dealing with others. Certainly I can tolerate a few objectionable traits in others to be able to connect with them and support them. There are many good suggestions in this book. I liked the one for hospital visitation. George shares the story of being an inexperienced pastor and not knowing what to do when visiting the hospitalized. An experienced pastor suggested presence and prayer. People want to know they are not alone and that someone is praying for them. George is really transparent in the telling of his own stories. Readers will be able to identify with his experiences, I think. Reading this book reminded me we need each other in our Christian walk and gave me good ideas on how to connect with others. There are discussion questions provided at the end of each chapter so this book could be used in a small group. Rusty George is the lead pastor of Real Life Church in Valencia, California. Through his 11 years at RLC, the church has grown to over 6,000 people and three campuses. He speaks regularly at conferences across thee country. He lives with his wife and two daughters in Santa Clarita, California. I am not a fan of Regency fiction and was hesitant to agree to review this novel. The beginning got off to a rough start for me as the author assumed, I think, that I was familiar with the customs of the era. I had to find out what an entailment was to understand what was going on. About a third of the way into the book, however, I began to enjoy the story. This is your typical romance. A common business man, now Lord of the manor, once loved Catherine, the woman he just forced to move out of the manor. Maybe he still loves her and she him. But misunderstandings present huge obstacles and one wonders of they will every get together again. I was impressed with a couple aspects of the novel. One was the study of the customs of the entitled people. Christian charity and loving behavior was pitted against the cultural norms of the day. Catherine tried to show Christian love and compassion to others while her mother was a jealous and somewhat heartless person. I also liked the way some of the characters were developed. Catherine's aunt was a pistol, saying what she thought and shocking many with her truth. Another aspect of the novel I liked was the clear demonstration of the effect rumors had on one's reputation. And at that time, reputation was everything. I did have trouble liking the main characters, Catherine and Jon, however. Catherine seemed immature and impulsive for her age. I would have liked her better had she been more truthful. And Jon did not seem a very compassionate man until almost being forced into it. Granted, they had both been hurt but I like to see characters rise above hurt to be excellent. I do recommend this book to those who enjoy Regency romance novels. After the initial rough start, I did enjoy the author's writing style. There was some pithy dialog and some humor along the way. But the main attraction of the novel will be the typical romance plot. You can download a discussion guide and find out more about the book and Bath at https://www.carolynmillerauthor.com/miss-winthrop. Carolyn Miller lives in New South Wales, Australia with her husband and their four children. She is a Regency romance writer with three books being published each year. You can find out more at https://www.carolynmillerauthor.com/. The title says this is a book about being a mom. It is much more than that. This is a challenging book for all Christians, not just mothers. I have no children yet I was especially challenged by her chapter on loving children “too much.” The concept of laying down husband, children, future, health, all that we have, on a figurative altar is a disturbing challenge. The concept that my love for God is to be so much greater than my love for people that my love for people would look like hatred in comparison - that is quite a challenge. Another chapter that really impressed me was the one on skewed beliefs. Cassidy tells a great story about how she developed skewed belief from childhood experiences. She offers practical suggestions for identifying those beliefs and how to instill correct beliefs. She has included an excellent chart identifying lies, the truth, and Scripture references. Yes, this is really a book for moms who want to be good ones but feel overwhelmed by struggles and failures. Cassidy writes that God provides a path for us to live in His abundance and peace. But the path requires that we know God intimately and follow Him whole heartedly. The result is peace in all areas of life. She includes stories from her own life and from others that illustrate how her teachings work in real family life. I highly recommend this book. Cassidy identifies so many issues in our Christian lives that cause a lack of peace. She also includes a great deal of good teaching and practical suggestions for having a relationship with the Lord, the source of all peace. And for moms? There is also a great deal of wise parenting teaching too. This is not a read it and forget it kind of book. There is so much good and practical teaching in this book, though I am not a mom, I'll return to the concepts again and again. April Cassidy is a wife, mother of two, part-time pharmacist, and blogger in Columbia, South Carolina. She started both The Peaceful Wife and The Peaceful Single Girl blogs in 2012. You can find out more at www.peacefulwife.com and www.peacefulsinglegirl.com and on her YouTube channel. Writing an allegory with a gospel flavor is a tough task. Clark has done a good job of creating a world where good and evil are in a battle for survival. The evil Mornoc and his nefarious scouts are a good allegory to the devil and his minions. On the good side are faithful people who believe the Promise from so long ago. There is a promised one who will come to rescue his people. But it has been so long and some no longer are convinced the Promise is true. This is a good beginning to an epic fantasy adventure in the style of Lewis or Tolkien. There are heroic characters faithful to the Promise. There are spies from the dark side. There is the hope of renewed life in the midst of the death of Mornoc's mountain refuge. There are epic battles. There is a princess and the hint of a romance. Readers are left wanting more at the end of this volume. Mornoc thinks he has the upper hand and the good people of the Promise must try a rescue before all is lost. I'll be looking for the next in the series. 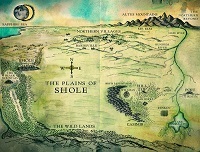 You can see a map of the land and read more about the plot and the characters in this novel at https://www.jaffreyclark.com/the-reapers-seed.html. I was interested to read about the origin of the character names and their meanings. If you plan to read this novel, I'd suggest you check out the site first and I think that will give additional meaning to the novel's content as you read. Jaffrey Clark has been telling stories since childhood. While studying accounting at Penn State University, he started writing his first novel. That one remains unfinished but he is well on his way in publishing several fantasy novels. He lives in Pennsylvania with his wife and their two children. You can find out more at https://www.jaffreyclark.com/. It might seem that the Bible is disjointed, that the Old and New Testaments are not cohesive in their theological views. But Schreiner claims that the biblical theme of the kingdom is a thread that runs through the entire Bible. Schreiner argues that Christians must understand the kingdom to truly know Jesus and understand the gospel. He suggests the kingdom is the framework for all of Scripture, that the other themes in Scripture revolve around it. Schreiner begins by defining the kingdom of God in terms of power, people, and place. He shows how the theme flows through the Old Testament and that it was always God's objective to establish a kingdom on earth. (Loc 338/1618) He goes through the law, the warnings and promises of the prophets, kingdom prospering in the wisdom literature, its embodiment in Jesus and its unexpected nature as revealed in the New Testament. I recommend this book to Christians who desire to understand the kingdom of God as the theme that runs through the entire Bible and the role of the cross in that kingdom reality. Patrick Schreiner (PhD, The Southern Baptist Theological Seminary) is assistant professor of New Testament and associate dean at Western Seminary in Portland, Oregon. He is the author of The Body of Jesus and various articles and essays. You can find out more more at http://patrickschreiner.com/. Brown has crafted an international suspense novel that could be tomorrow's headlines. The features I liked best were the advanced robots and drones. This is the future of warfare, I think. I was also fascinated with the computer work done by Smart Metal to investigate the terrorists' plans. This novel portrays a whole new aspect on the war against terror. I recommend this novel to readers who love a plot full of action and suspense revolving around cutting edge technology. I received a complimentary digital copy of this book through Partners in Crime Virtual Book Tours. My comments are an independent and honest review. 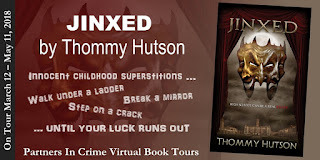 The rest of the copy of this post waas provided by Partners in Crime Virtual Book Tours. A lifelong resident of the Pacific Northwest, reading southern fiction is like entering another country. Mayne has done a good job, I think, at presenting the family dynamics of an extended southern family. There are the tendrils of jealousy that weave their way through relationships. There are the young women who are happily single but whose mothers think they'll end up old maids. There are the husbands who would rather go hunting than to a family reunion. There are also the sweetest of sisters-in-law who would help a family member regardless the cost. The point of view alternates between five women in the extended family. That might not be the easiest way to present a story but it did flow more smoothly than I had anticipated. I did find it interesting to read how the various women reacted to events. I recommend this novel to readers who enjoy a character driven plot highlighting the complex relationships found in an extended southern family. There is not a whole lot of excitement, action or suspense. But the family drama is intense and very interesting for a northerner like me. You can read an excerpt here. You can buy the book here. Debby Mayne and her husband Wally recently moved to North Carolina so they could get even more hugs and snuggles from the granddaughters. It's also the ideal place for an author of southern women's fiction. Debby and Wally have 2 beautiful daughters, 2 handsome sons-in-law, and 2 precious granddaughters. Between novels and cuddling the granddaughters, Debby also writes etiquette articles and does freelance copywriting. You can find out more at https://debbymayne.net/. This dictionary was compiled by two college and seminary professors. They chose topics they expected their students to know after a year of study. It is aimed at being a resource for first year students. It is not exhaustive. Nor is it aimed at laypeople, it seems. It includes topics in which laypeople would have no interest. For example, Akitu Festival (probably a Babylonia New Year's ritual), and Apsu (a character in the Enuma Elish), and Community Rule (a manuscript among the Dead Sea Scrolls). Scholars and their theories are also included, such as Jean Astrue (developed the Documentary Hypothesis of the composition of the Pentateuch, which hypothesis also has an extensive entry) and Hans Conzelmann (German NT scholar). These kinds of entries would be of interest only to those in seminary or Bible college, I think. There are many entries that are good for the average Christian in the pew. Dispensationalism, for example, and doecetism. There are cities and countries defined, such as Gath and Egypt. But there are many that I found totally uninteresting as a layperson. Would I ever be interested in the definition of diachronic, referring to an analysis of the relationship between earlier and later texts? I think not. Do I need to know that Enki is the Sumerian name of a Mesopotamian god not mentioned in the Bible? And I am just not interested in the many and various forms of criticism the authors include. Nor do I want to read about David Friedrich Strauss who said the miracle stories in the gospels were myths and legends created by the early church. While this book may be useful to first year seminary students, I think its use by the average layperson is very limited. Tremper Longman III (PhD, Yale University) is Distinguished Scholar of Biblical Studies at Westmont College in Santa Barbara, California. He previously taught at Westminster Theological Seminary in Philadelphia for eighteen years. He has authored and co-authored numerous books. Mark L. Strauss (PhD, University of Aberdeen) is University Professor of New Testament at Bethel Seminary. He is the author of several books. He lives in California. Sometimes life can just seem to be too much. We might wonder just how much one woman is supposed to bear. Clemence is very familiar with the stress one can feel from life. She suggests there is a better way to live life. Clemence covers three stress producing areas of life. First is life in general, the broken washing machines and other disasters. Then she attacks the stress others cause – the kids, the animals, the odd extended family members. Last is the stress we cause ourselves – like perfection or over scheduling or discontentment. I like that Clemence writes with honesty and humor. I could identify with so many of her experiences, like the male cat who just had to mark his territory in their house. I also like the wisdom and insight she shares with us. She has included great questions at the end of each chapter that are good for personal reflection and action. She also shares Scripture and a prayer. I recommend this book to women who feel overwhelmed. (Well, men can read it too but they are asked to skip the sagging body parts section.) You'll get some laughs but you will also be presented with wisdom and insight on living life well. Jessie Clemence is a writer, blogger, and church secretary based out of Kalamazoo, Michigan. She has also been a social worker in the foster care system, a children's ministry coordinator, and a lunch lady. She is the author of two previous books. You can find out more at http://jessieclemence.com/. This book contains seven great stories of lives being changed by the grace of God. Each one is unique. Some experienced parental abandonment. Others were sexually abused. Some tried hard to get out of the mire while others made choices that brought them deeper into despair. When they cried out to God, He came to their rescue. These stories are evidence that God is very much in the life transforming business. The book is an encouragement to anyone wanting to make a new start in their life. There is a prayer at the end of the book to help readers who want to ask Jesus into their lives and surrender to God. These are first person stories of God in His rescue work. The book does not contain any additional teaching on being healed from hurts or on overcoming disadvantages. Readers who want practical suggestions for growth after God's rescue will have to look elsewhere. Jim Cymbala has been the pastor of the Brooklyn Tabernacle for nearly forty years. He is a bestselling author and lives in New York City. He and his wife have three grown children, eight grandchildren and two great-grandchildren. Ann Spangler is an award-winning writer and the author of many bestselling books. She and her two daughters live in Grand Rapids, Michigan. You can find out more at http://www.annspangler.com/. This book is about the power of sacred choices and good decisions, decisions we make every moment. I am impressed with this book. Harrington has spiritual insights I've not seen before. She has filled this book with great teaching and practical ideas for godly living. I like her clarification of holiness. We might think holiness is a certain behavior. But holiness is a reflection of who we are in Christ. Righteousness is thinking, feeling and acting as the person God created us to be. We begin with God's holiness and exercise our faith by putting God's will before our own. My favorite chapter was the one on the sacred gift of concentration, important to those of us with SDD, spiritual deficit disorder. The teaching that impressed me the most by far was that on surrender and suffering. “Surrender is our hardest, most sacred prayer as, like Jesus, we submit our desires to God. … When we trust God in our suffering, choosing to pray and accept His will, we release our deepest worship.” (Loc 1058/2560) That really spoke to me. While there are no questions for reflection as such, there would be much to discuss if this book was used in a trusted group setting. Harrington has included many practical suggestions that are perfect for an accountability group. Ginger Harrington is an award winning blogger, entertaining speaker, and innovative ministry leader. She is the Coordinator if Publishing for the non-profit, Planting Roots: Strength to Thrive in Military Life. She has a master's in English, has been involved with the Navigator's military ministry and women's ministries as a teacher, speaker, and trainer. She spent twenty four years moving around the U. S. and overseas as a career military spouse. You can find out more at https://gingerharrington.com/. 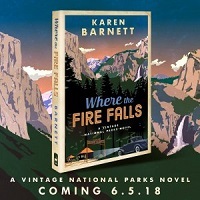 Barnett has given readers another fun historical adventure at a national park. We are transported to Yosemite National Park in 1929. Our main character is an up and coming water color artist who has an assignment to provide illustrations of the park for a magazine. Olivia needs the money but is concerned about her father's previous experiences at the park. If that dark secret got out it could ruin everything. I appreciate the descriptions of the many beautiful features in the park's valley. Having visited the park just a couple of years ago, I liked that some of the characters expressed their emotional feelings of wonder at the scenery. I do wish there had been more detailed descriptions so readers could really get a sense of the park's wonders. I felt the plot was a bit weak. Perhaps there were just too many aspects to it. In addition to the dark secret of Olivia's father was a wealthy and lecherous Vanderbilt as well as Olivia's greedy and very dangerous agent. To counter these was a valiant park employee. The plot provided a good deal of suspense and romance. I was disappointed that the role of Olivia's father just sort of faded at the end and was not resolved well. I do recommend the novel to readers who enjoy an historical romantic suspense set in Yosemite Valley. Just don't expect to be overly in awe from the descriptions included in the book. This book releases in June. Karen Barnett is a former park ranger and outdoor educator. She has written five previous novels, enjoys photography, hiking, and public speaking. She lives in Oregon with her family. You can find out more at http://www.karenbarnettbooks.com/. Don't read this late at night, not if you want to sleep well. Hutson has crafted a youth novel that chilled me to the bone so many times with its many scenes of terror. There are some graphic slasher moments so queasy stomachs beware. Along with the horror of being stalked by a crazed killer is the craziness of teens. At times I thought some of the characters were being too light hearted in the face of impending murder, but perhaps teens are like that. This book does have a good balance between scenes of teen relationships and scenes of abject fear. And there is such a twist at the very end it took my breath away. Teens who like horror movies will love this novel.